Highland Woods Golf and Country Club is located in sunny Bonita Springs, Florida near the intersection of US 41 (Tamiami Trail) and West Terry Street in south Lee County. From Interstate I-75 take exit 116 to West on Bonita Beach Road to North on US 41 - Tamiami Trail. Highland Woods is just north of the Imperial River boat ramp at the bridge. The community of Highland Woods offers condominium homes, attached villa homes and single family villa homes. Condominiums are available with either covered parking or a one car garage. There are 800 residences in Highland Woods. The community of Highland Woods is built out and only resales are available. Each and every home owner at Highland Woods enjoys golf privileges. Additional amenities of include guard gated access, tennis club, fitness center, swimming pools, putting green, driving range and country club. Highland Woods lease structure allows for up to 12 leases per year with 30 day minimum stays. The golf membership and use of the amenities transfers to guests and tenants for a small fee. Communities located within Highland Woods include, St. Andrews Veranda, Heathermoor, Highland Woods Villas and the Terrace condos. 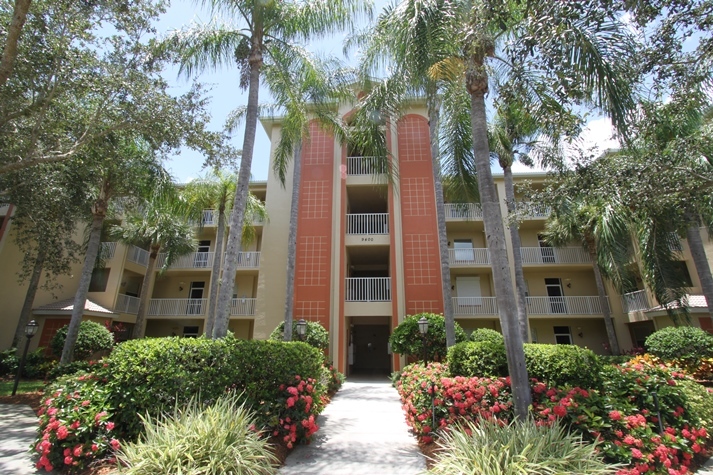 Highland Woods is centrally located and only minutes to the gulf beaches of Bonita Beach and Barefoot Beach. Nearby shopping includes The Fresh Market grocery, department stores, fine dining and boutique shopping at The Promenade. The Coconut Point Mall is only 10 minutes due north. Southwest Florida International Airport is approximately 25 minutes away. FGCU is about 20-25 minutes away. New infrastructure in the area includes wide bike and walking paths to various points of interest, stores, shopping centers, banks and post office. Highland Woods has a sister community in Fort Myers with similar amenities and the same floor plans, plus more single family home plans available. The community is Heritage Palms. To locate other homes and condos with golf privileges included with home ownership read also: Bundled Golf Communities in Bonita Springs.